Anne's Fitting Show, an interactive ad display that allows shoppers to dress up a holographic incarnation of Japanese supermodel Anne Watanabe in World's "Untitled" brand clothing, has been set up on the first floor of the Takashimaya department store in Shinjuku. Anne, who is the daughter of actor Ken Watanabe, is shown in the flesh on the right (her holograms are on the left). 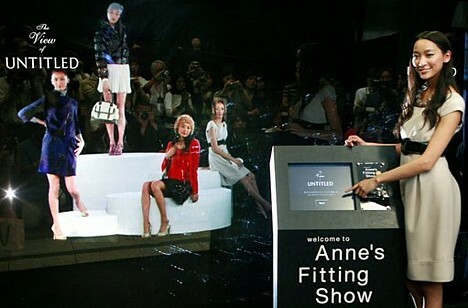 The 3D ad system features an external touch-screen control panel that allows aspiring fashion coordinators to select from 4 situations -- "Date," "Work," "Party" and "Holiday" -- and arrange 12 different fall/winter outfits for Anne's hologram, who walks around in the glass-enclosed booth showing off the selected clothes. The interactive 3D ad, said to be the world's first of its kind in the fashion industry, relies on Danish advertising media company viZoo's Free Format holographic film technology. Anne's Fitting Show will be on display until September 24.